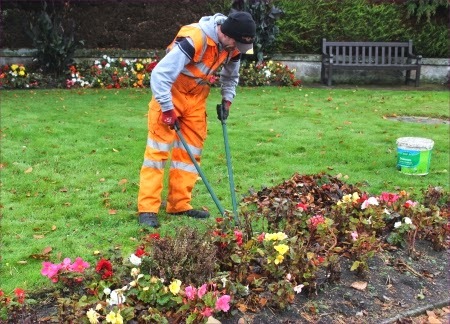 Nearby the Council Grounds squad were busy tidying up the borders and grass edges. The begonias had a good year but are giving up and it is time for them to come out. The lack of a serious frost up to now extended their life long enough to give as a flash of colour right into October. 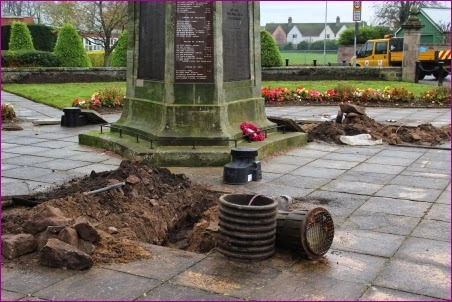 Much as I respect the war memorial why in a time of austerity are we upgrading the lighting? Perhaps they were simply past their best and had to be replaced anon. Why not consult one of your Councillors? Weren't the original lights supplied via some Hydro Electric scheme? Never mind the lights what about the state of the War Memorial!